In Sandy’s immediate aftermath, recovery efforts throughout the metropolitan area were understandably focused narrowly on rebuilding and on fortifying the shoreline against the next storm’s onslaught. But over time a quiet shift in thinking and in priorities began to happen, not only among the government agencies, planners, and designers tasked with rebuilding, but among the residents of the shoreline communities. The word “resilience” itself came to be defined in a broader and more nuanced context for those were experiencing firsthand what it really takes to restore damaged communities and natural systems. ​Tottenville’s Living Breakwaters was designed as an answer to that question. One of six winners of Rebuild by Design Competition, organized by the US Department of Housing and Urban Development in Hurricane Sandy’s aftermath, it will create a system of man-made breakwaters constructed of rock and bio-enhanced concrete units, seeded and hopefully fortified with the very same oysters that had once put Tottenville on the city’s culinary map. The plan is that as the oysters propagate, they will both strengthen the breakwaters over time and create the requisite conditions for more biodiverse marine life to flourish. The schematic design phase of Living Breakwaters is expected to be 30 percent complete by October 2016. If all goes as planned, the design will be finalized by the spring of 2018 at which point construction will begin. The scheduled completion date is late 2019. 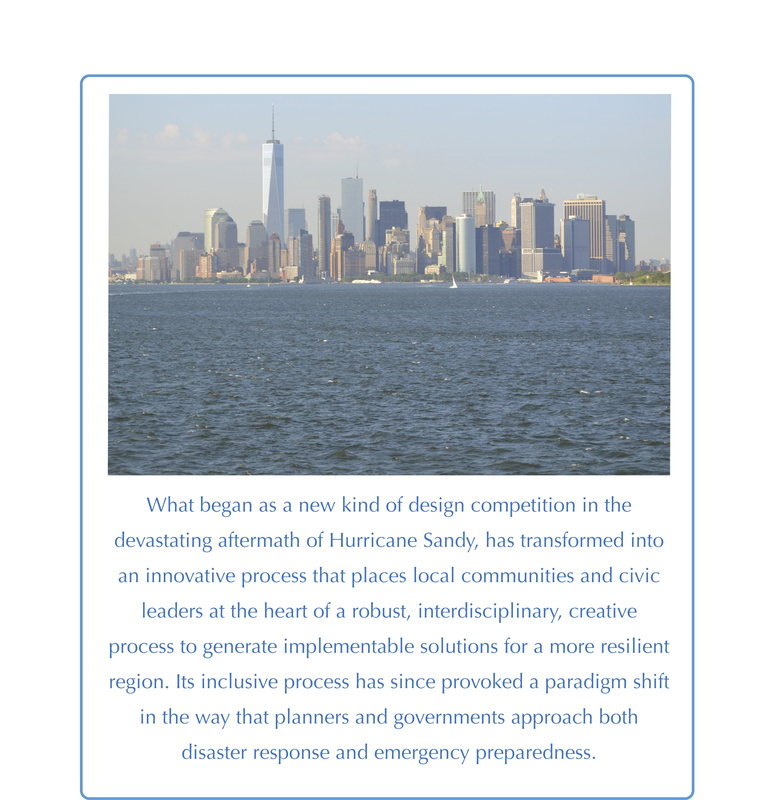 ​What began as a new kind of design competition in the devastating aftermath of Hurricane Sandy, has transformed into an innovative process that places local communities and civic leaders at the heart of a robust, interdisciplinary, creative process to generate implementable solutions for a more resilient region. Its inclusive process has since provoked a paradigm shift in the way that planners and governments approach both disaster response and emergency preparedness. 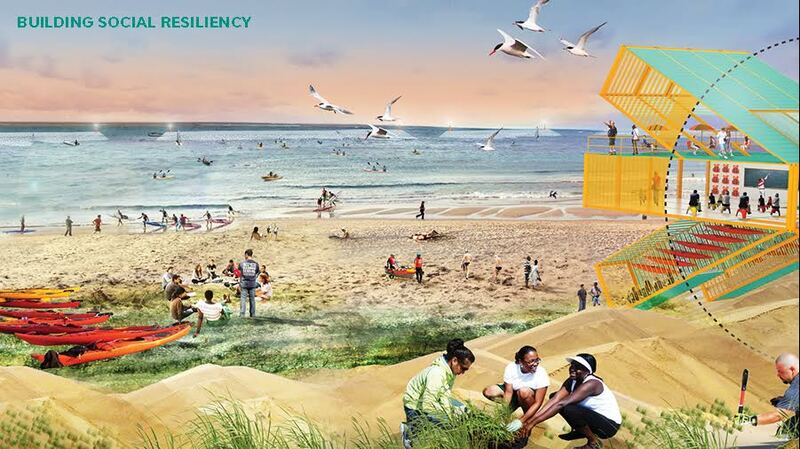 Placing substantive collaboration between designers, researchers, community members, and government officials at the heart of an iterative creative process, the Hurricane Sandy Competition resulted in ten visionary design proposals that address the intersection of physical, social, and ecological resiliency. Seven of those designs are in the process of being implemented in the Northeast United States. 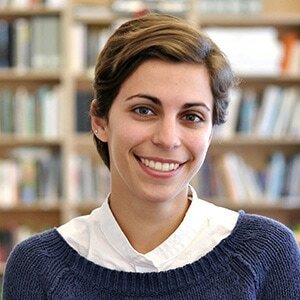 Based on its success, Rebuild by Design has been used as a model for other processes. 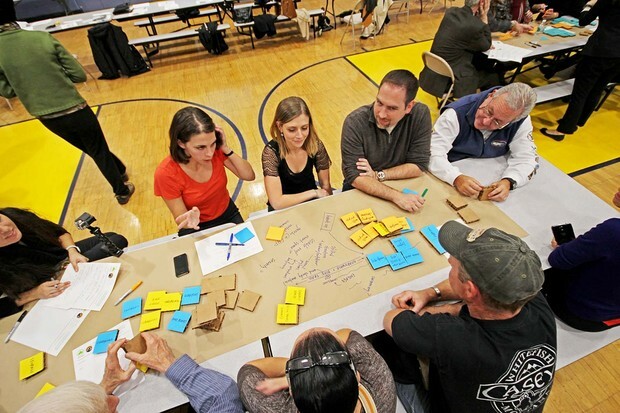 In the United States, President Obama launched the National Disaster Resilience Competition in June 2014, “inspired by the success of Rebuild by Design.” In the international sphere, the Global Resilience Partnerships launched a multi-phase resilience design competition in 2014 modeled after Rebuild by Design. In addition to as helping other regions rethink resilience before disaster strikes, Rebuild by Design keeps communities connected to the implementation of the funded designs; explores changes needed in policy, regulation, and operations; and researches the best practices in developing resilience. The New York State Governor’s Office of Storm Recovery has received $60 million in funding for the design and implementation of the project. For an infrastructure project of this magnitude, the level of intentionally planned community engagement is also unprecedented. Rather than relegate decision making to the “experts,” the community has been included in the shaping of the project from inception. Creating opportunities for residents to assume stewardship of their reclaimed marine heritage has been baked into the project, not just during the conceptual phase, but on an ongoing basis. While it might have been anticipated that residents would clamor for the tallest breakwaters and for maximum protection that hasn’t been the case. ​Based on community input, a community Water Hub facility is also proposed to be located on the shores of city-owned Conference House Park, providing access to the waterfront, and opportunities for birdwatching, kayaking, and general marine stewardship and shoreline education. The facility will likely include classrooms and labs, where students and teachers from the Harbor School on Governor’s Island and local Staten Island schools will be engaged in oyster restoration and reef building. John Kilcullen, Director of Conference House, is eager to see the Water Hub come to fruition, although the challenge will be to find additional financing for the ongoing activities that will hopefully take place there, since HUD funding will not cover them. Kilcullen sees the Hub as a way to lure visitors to his park, so rich in history and historic buildings, walking trails, an Indian burial ground, and potential for water-related activities. “Sandy is making everyone rethink the waterfront,” he says. The Living Breakwaters project was conceived from the outset as a layered approach to coastal resiliency, with a protective dune system combined with the breakwater structure. Another government-sponsored program, NY Rising, is working alongside Living Breakwaters on this project. Lauren reports that sociologist Eric Klinenberg, an advisor to the Rebuild by Design competition who has studied how communities come back from natural disasters, has discovered that those that bounce back the best are not necessarily those with the most massive barriers against storm damage but those that have the strongest community ties.